One of the most challenging things I've found about being a uni student is having to make your own food daily. It can be very long, tedious, draining and expensive. I'm the type of person who gets very bored of eating the same food regularly, so I'm always on the lookout for ways to remix traditional meals. Last night, I thought to myself rather than have my chicken dippers with chips as usual, why not make a chicken dipper stir fry instead (so that's what I did)? This meal didn't cost me anything as I had all the ingredients lurking around in my cupboard and freezer already, but if you guys wanna try this out at home, I've sourced the prices and shops for you down below. On average, this meal would cost about £1.24 to make per portion. 1. Put x amount of chicken dippers on a baking tray and cook in the oven as per packet instructions. (I had 14 which was far too much, so I'd say about 6-8 for each person should be enough but you can adapt this to your usual portion size). 2. 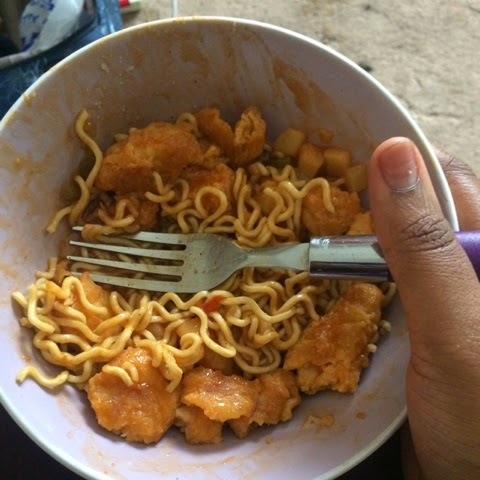 5 minutes before the chicken has finished cooking, take the noodles out of the packet and place in a bowl. Season with packet contents. (This is optional). 3. Boil a kettle, and fill your bowl until noodles are saturated in water. Place bowl in microwave for 2-4 mins (as per packet instructions). When the noodles have cooked halfway, stir with a fork, then place back in the microwave to continue cooking. 4. Drain noodles with sieve, then leave in bowl. 5. Place 125ml (approx) of Sweet & Sour Sauce in a small bowl/ measuring jug. 6. Take chicken dippers out of the oven and chop each piece into thirds. 7. 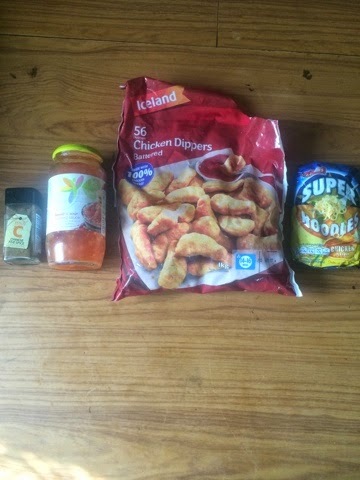 Place chopped chicken dippers into sauce and microwave both together for about 30 secs- 1.5 mins depending on the power settings of your microwave. 8. Add the noodles to the mix and season to taste. (At this point I used my 5 Spice seasoning and sugar. You may wish to add these also or any alternative seasonings you may have). *I paid £9.50 for a box of 40 from my local African supermarket. Be sure to check out what deals are available in your area, or alternatively just buy a cheap pack of noodles from Lidl or Aldi. Super Noodles are a great affordable alternative too!